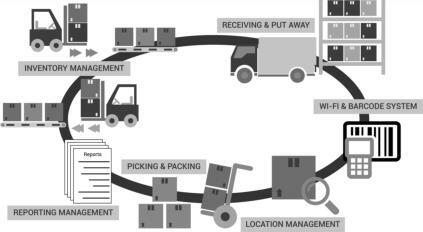 RFI Warehouse Management Solutions We offer systems to drive productivity and improve stock control. • ScanWorx has been developed by a Sydney Arrow/Tencia Dealer that enables the complete Automation of your warehouse operations with full integration to Arrow or Tencia. • ScanWorx acts as the intermediary between Tencia and all stock related movements. • Using Wireless Hand Held barcode devices warehouse personnel record each movement of stock through the warehouse from product receipt to customer dispatch. • Actoined by barcode scanning and entry of - o Sales Orders o Packing Slips o Delivery Shipments o Purchase Receipts o Production Order Receipts o Stock Transfers o Stock Take • From an operational perspective the ScanWorx user interface consists of the following elements - o Handheld Mobile Wireless Devices. o PC Based ScanWorx Console. o Transport System Interface - Specific Carrier Software Only. o Graphical Stand Alone Key Performance Indicator Screen.